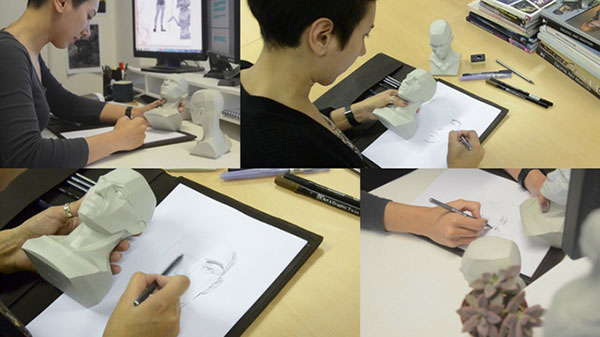 3dtotal is currently running a Kickstarter campaign to fund an extension to their excellent Anatomy reference range. With nine figures currently available, this campaign adds 3 additional reference figures plus an exciting new book. I had recently reviewed their wonderful Anatomy for 3D Artists and am very eager to see the new book they are proposing: The Artist's Guide to the Anatomy of the Human Head. More than that, I am excited about their new solid cast, grey resin male and female planar busts, and an adaptable male figure. Drawing from a photo reference can be tricky. But, having a planar bust at your disposal can be a huge help as a reference for light and shadow in its angular sections. And, the proposed adaptable male figure is perfect for studying muscle structure, as it has changeable parts for different poses. Have a look at the Kickstarter page for more details and a video introduction.